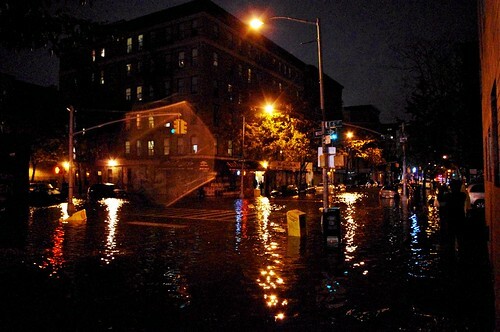 The East Village, NYC flooded during Hurricane Sandy, shortly before the power went out in downtown Manhattan for several days. Photo by David Shankbone, via Flickr. I hope any readers on the East Coast made it through Hurricane Sandy safely. Despite my location in New York City I was largely unaffected. Other New Yorkers were not so lucky, especially in Staten Island, the Rockaways in Queens, South Brooklyn, and Lower Manhattan. Many galleries in West Chelsea, including the non-profit Printed Matter (which focuses on artist's publications) were very hard hit and are still cleaning up now, over two weeks after the storm. Artists with studios in coastal or low-lying areas also suffered damage. Beyond the arts community, thousands in the city and throughout the region are still without power and some don't know when it is coming back. Though my own day-to-day has returned to normal the picture is much more grim for many. But despite this devastation I am happy to report that the arts community is pitching in to help those in need. The Delaware Art Museum and the Newark Museum both offered free admission in the days immediately following the storm. Newark set up free wifi and charging stations for visitors without power. And Klaus Biesenbach, director of MoMA PS1 (a fabulous contemporary art institution in a former public school building in Queens, sort of a "little sister" to MoMA) has been a tireless advocate for the Rockaways, mobilizing his staff and others to volunteer in cleaning up the flooded that is still without power. I recommend you follow his Twitter feed if you are interested in keeping up with what is going on out there and, if you are in the tri-state area, how you can help. If you are interested in further information on how Hurricane Sandy has impacted the arts in the tri-state area, I encourage you to follow Hyperallergic.com's coverage, which has been tireless and comprehensive. It includes updates from museums, galleries, art spaces, and individual artists from during the storm as well as the aftermath and how individuals and organizations are helping cleanup and relief efforts. **UPDATE: This ARTnews piece also has great information including how Klaus Biesenbach has helped out in the Rockaways and information on a Queens Museum of Art fundraiser. A final thought - more than ever, the aftermath and cleanup from Sandy has driven home for me the importance of creativity and problem solving skills. In the past I have talked about those skills in the workplace, but what about for disaster relief? Some of the most effective relief efforts here in New York have come not from the usual suspects but from creative upstarts like Occupy Sandy and the New York City Food Truck Association, who, in a stroke of genius, have been serving food to hungry and powerless areas of the city. Times like this are not just when we need art's power to soothe but also creativity's power to help rebuild. As a fifth-generation member of the Davis family, Alison Wade has been immersed in art education her whole life. She is a founding member and secretary of Advocates for Cultural Engagement, a student arts advocacy group at NYU. Alison has worked for an art tour company in Washington, DC and interned with Americans for the Arts as well as the Museum of Arts and Design. Alison became interested in the arts as a profession while working for Davis Art Images during high school. Currently, she is an arts administrator interested in arts policy and advocacy, nonprofit management, and art education. She is finishing her Master’s Degree in Visual Arts Administration at New York University, where she wrote her thesis on the topic of artist housing programs. The Most Important Trend in Arts Programming in the Past Five Years. Are you on it? The Carrot Revolution: A Blog About Art Education... and Vegetables. Guest Blog, Jane Remer: The Metropolitan Opera to the Arts Ed Rescue???? ?